The Mass Mixer Machine is basically mixing a assembly where in the mixing stirrer is in horizontal position in the container & has a single speed, simple rotation. 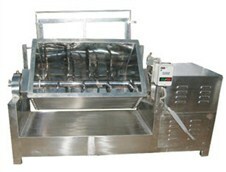 The stirrer rotates around itself at a very slow speed inside the bowl, thereby achieving intimate mixing of dry or wet materials of Tablet Granulation, Powder, Chemicals, Food & Confectionaries etc.. Range of models to suit working volume 50,100 & 200 Kg. All contact parts are made out of S.S.304 quality material. Contact parts are polished to a mirror finish and non-contact parts are polished to the matt finished in GMP Model. Container tilting system provided for easy unloading of material and easy cleaning. There are no threads in Dynamic Engitech Pvt. Ltd Mass Mixer Reviews at this time.